Wacko Jacko is flogging a load of his stuff, it’s pretty old news but still in time for the auction, set to take place in Beverly Hills in April 2009. It’s interesting to see what someone like Michael Jackson has collected over the years, The Guardian have got some pictures of a small fragment of the 2000 lots. There’s the expected weirdness like the oil painting of him dressed up like a king, the way over the top stuff like his enormous Gaggia coffee machine. 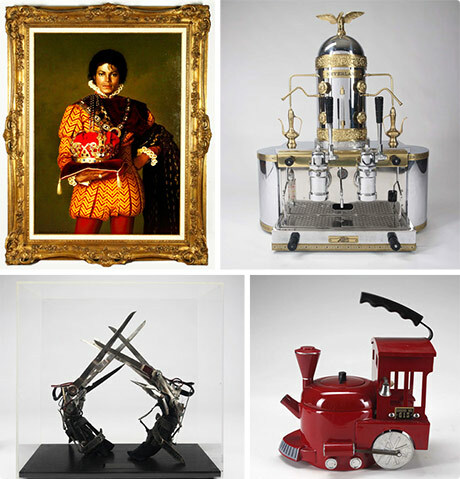 Interesting collectibles like the the prop ‘scissorhand’ gloves from Edward Scissorhands, also some nice normal stuff that I’d quite like to buy like that amazing red fire engine kettle. The guide prices seem well lower than I imagined – Micheal Jackson’s red velvet cape for only $300-$500? I think not, surely this stuff will go for 10-20 times the asking price. Feb 24	This entry was posted in Bizarre, Stuff to Buy by cookie. Bookmark the permalink.